*This cuvee is named for Jim Clendenen’s son. 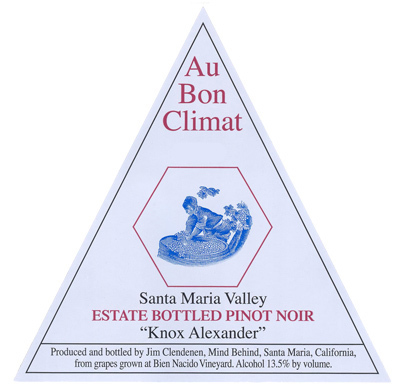 This wine is selected from estate grown plantings at the Bien Nacido (block 11 planted in 1997) and Le Bon Climat vineyard (planted in 1998) both located in the Santa Maria Valley. These two vineyards are only separated by the Sisquoc River. This cuvee annually has 50% traditional California “selections massales” and 50% new Dijon clones. The blend includes from Bien Nacido Vineyard: Swan, Jackson, 115, 777, 667, 2A, and Pommard clones and from Le Bon Climat Vineyard: Mount Eden, 2A, and 667 clones. The fruit is hand harvested and vineyard sorted. After destemming, the must was fermented open top 5 ton fermenter. To regulate the fermentation and maximize extraction the fruit was punched down by hand twice a day. The wine is transferred to Francois Freres French oak barrels, about 75% new, and aged for 22 months except for a gentle racking after one year. The wine is bottled without filtration.